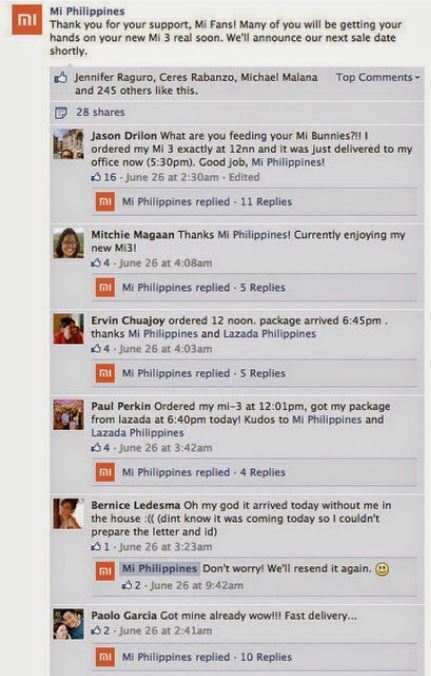 Thousands of Filipinos are getting their mouse-trigger fingers ready for Xiaomi’s second Mi 3 smartphone flash sale happening today at Lazada Philippines starting 11:00 AM. True to its online sales strategy, the Chinese mobile brand’s two-hit debut has been welcomed with much gusto and left the market craving for more. 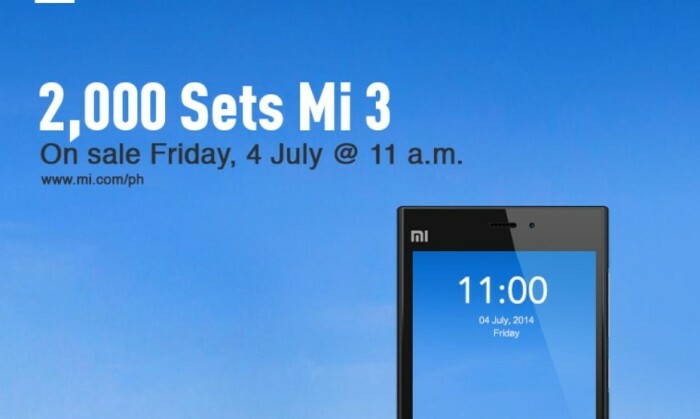 With limited stocks and enormous online buzz, local bloggers estimate that 2,000 Mi 3 units were sold out in less than two hours during the first flash sale last 26 June. Official results are tight under wraps but, after crunching the numbers, this virtually unknown brand in the Philippines (except for avid mobile fans) has already netted around P 21.2 million. This time around, Xiaomi could see earning another P31.8 million from its second flash sale stocked with 3,000 units. 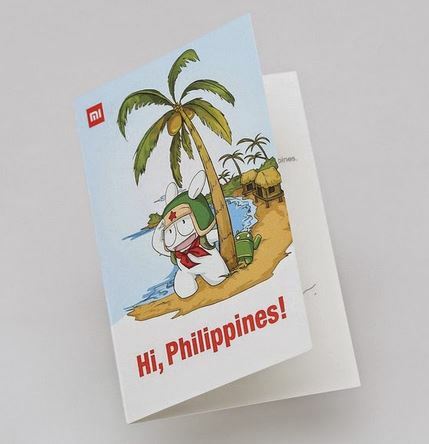 Xiaomi global VP Hugo Barra reported that 75% of the orders had been delivered and 25% of which were delivered on the same day of the first sale – a feat considering the various parts of Metro Manila were flooded on that day. Below is a snapshot of the positive reviews Xiaomi got on its official Facebook page. 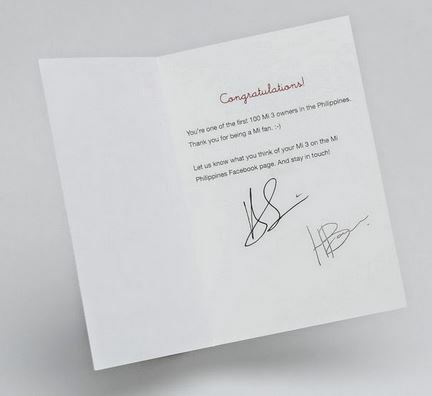 For a personal touch, the first 100 orders included a thank-you card personally signed by Xiaomi global VP Hugo Barra and Xiaomi co-founder Bin Lin, which, as expected, was shared by happy Mi 3 owners throughout the social media space. The brand’s biggest selling point is its price, with a Mi 3 costing at a jaw-dropping P10,599 – over a 100% more than similar specced flagship models from the likes of market leaders Samsung and Apple. But Xiaomi’s real innovation comes not from its amazing value for money but in its business model. Xiaomi sells its products online, never in stores, and devotes only about 1% of its revenue to marketing, according to Bloomberg Businessweek. Money saved by Xiaomi eventually benefits consumers by serving them high-end phones fitted with top-notch components without breaking their wallets. In comparison, Samsung allots 5.4% of its earnings to advertising. The company has relied heavily on social networks, creatively using online both as a sales and marketing channel. So far, the company has partnered with Lazada for its debut but will eventually open its local website to accept orders. “We live in social media. That is where our fans live, that is where they find out details. Our fans demand that they should be the first ones to know. We have to tell them first, we cannot tell the press first. They’ll be really mad if they would find out that they weren’t the first to know,” Barra said during a recent visit as quoted by HardwareZone Philippines.